Every morning, it seems like a startup raises a massive growth round. In fact, the data proves the point. In 2014, there were 251 working days and 211 $40M+ growth rounds - just about one per day. In the past, companies went public to raise large amounts of capital, because the IPO markets were the only place to do it. Going public meant a lot of internal work preparing for regulatory scrutiny, but a substantial cash injection and shareholder liquidity. Today, that’s no longer the case. The private markets have supplied $7B in equity in the past two years, and the public markets provided $37B, a greater than 5X multiple. Before Lehman’s implosion, it was the other way around. Startups raised 3-6x as much capital in the public markets. Large private market financings are very attractive for startups. 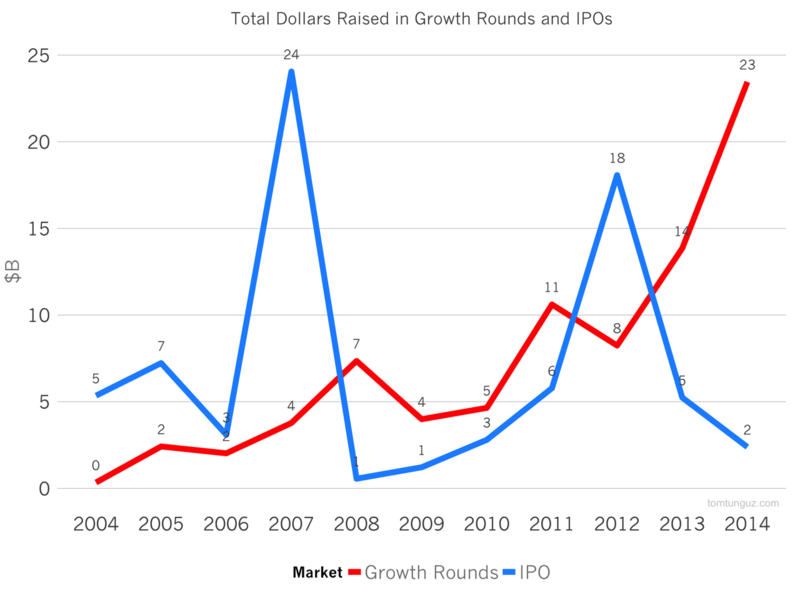 As the chart above shows, the average amount raised in a large growth financing of about $110M is roughly equal to the amount company could raise at IPO (setting aside the Facebook outlier in 2012). Why bother with the hassle of auditors and roadshows, when a company has to convince 40 or so public market investors to fill out a round, when one or two private investors will take the whole round after a few meetings? If high priced financings are the defining characteristic of this part of the technology cycle, one has to wonder what this private market exuberance implies for the next cycle. Glass half-full: we’re going to see a huge swath of IT IPOs in the next few years. Glass half-empty: many of the companies that have raised massive growth rounds won’t be financially fit enough to be able to go public, and investor/employee/shareholder liquidity will be a major challenge. The reality will bear out somewhere in between, and the limiting factor will be public market investor appetite for these tech companies. Of course, acquisitions will also become more common (2014 proved that trend). It’s a very heady time for startups and investors. There’s a marked separation between the investment preferences of public and private investors. 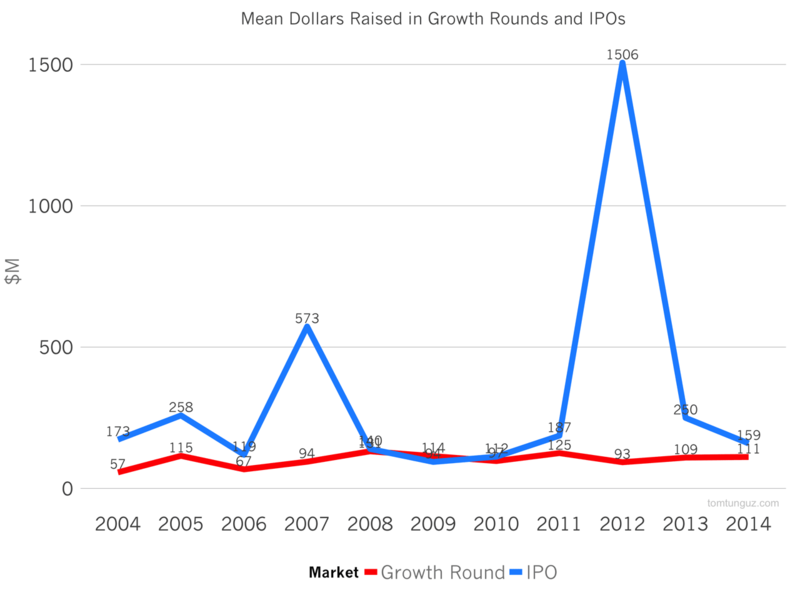 And while the initial data from the 2014 IPOs show private market investors still generate returns even when investing immediately before IPO, in many cases late stage private rounds are priced so aggressively that IPOs are down rounds. I’m not going to pretend to know how the future unfolds, or how the markets will evolve. The data shows, though, that the current investment levels aren’t yet justified by the exit environment. 231 companies raised $40M+ growth rounds in 2014. 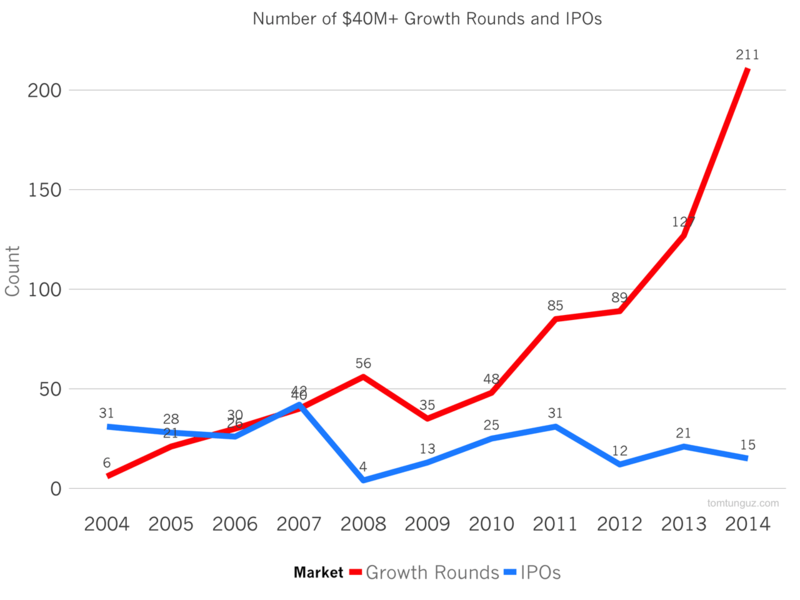 For comparison, roughly 240 VC backed IT companies have gone public in the last ten years. Said another way, we would need to 2x the number of IPOs in 2000 for all of these growth stage companies to become public. Who knows where this runaway train of financing will lead. It could be to one of the greatest exit environments in tech history or something much less rosy.